There is no greater form of hospitality than that of welcoming people into your sanctuary, the comfort of your home. This tradition was once embedded in the lives of most Lebanese who would keep their houses’ front doors constantly open to welcome visitors. With the passing of time and the shift in priorities in our increasingly busy lives, our front doors open less frequently. Now, it is only occasionally that we receive guests, let alone host brunches, lunches and dinner parties in the privacy of our houses. Most people have become hard-working professionals whose leisure time is too precious for them to spend in the kitchen cooking. That is why when they want to treat themselves to a fancy meal, whether alone or in company, they either go to one of the many restaurants that Beirut’s hospitality scene has to offer, or request the services of a catering company renown for delivering succulent food. Nothing trumps a cozy gathering in one’s humble abode. It not only offers a unique charm but also a certain value. Family feels loved, friends feel appreciated and acquaintances or business relations feel respected. This is why a couple of Lebanese entrepreneurs have decided to implement a business model that would surely encourage people to go back to hosting the good old-fashioned way. Fadi Kharrat and Jean Fares are initially engineers who specialized respectively in Design & Contracting and Management Consulting. They are also food lovers who really enjoy hosting people and holding get-togethers. 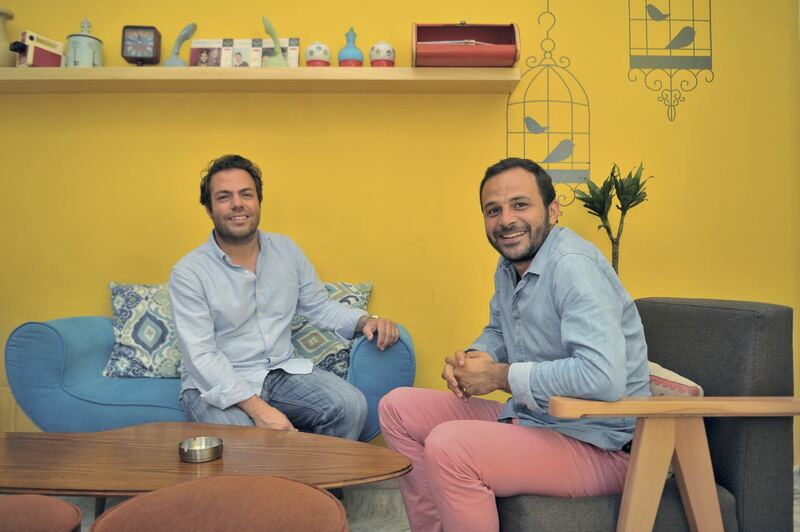 When they stumbled upon a video illustrating a concept of chef-at-home, one that they knew to be foreign to the country according to their own experience, they immediately became inspired to customize and apply it within the Lebanese market. Soon after, they were joined by a third partner, Makram Raydan, the man behind the start-up’s web development. Hence the design of ‘BiBayti’, which literally means ‘in my home’ and so perfectly embodies the venture’s primary theme. Indeed, BiBayti’s chief aim is to turn receptions in one’s home into a hassle-free and enjoyable experience thanks to the services of a talented culinary artist who would be solely responsible for all aspects of the meal served on that occasion. From picking and buying the necessary ingredients beforehand, to preparing and cooking the meal in-house, to crafting the food display and presenting the recipes to the guests; all would be handled by a talented cook, taking the edge off the host in the best possible way. BiBayti.com is an online platform that links individuals who wish to host any type of event in their homes to a wide array of chefs and cooks, whose singular recipes have been personally designed. The soon-to-be launched website is expected to be simple and user friendly. One side of BiBayti.com will be the host’s platform, where hosts are invited to select the type of the event (brunch, lunch, dinner), the preferred date, as well as the area of their home. Once that is confirmed, they will start browsing the different personal menus pertaining to the various professional chefs and amateur cooks. The latter would have also specified their availabilities during a typical week. The other side will be the chefs’ and cooks’ back end of the website. Each of them presents a description of themself and their specialties (with photos that give the host a good idea of the recipes’ presentation), a copy of one or more of their individually engineered and detailed menus, in addition to the pricing relative to the number of people each recipe can accommodate. Communication between parties starts as soon as the hosts make their selection. Slight modifications to the menu can occur after this selection, both in terms of quantity and specific ingredients. Finally, an e-payment is made prior to the event so that the assigned chef can start planning their purchases in preparation for D-Day. However, and this is one of the instances where BiBayti management exercises its behind-the-scene control, the e-payment is blocked until 24 to 48 hours following the event, during which the management collects the needed feedback regarding the event. After making sure the host’s expectations are met, the payment is then wired to the relevant chef. As asserted by the partners, this set-up would guarantee fairness vis-à-vis both parties. The cooks won’t have to worry about shenanigans that could occur in such situations, and the hosts would feel protected from unfortunate surprises. Needless to mention, BiBayti’s cancellation policy allows for a certain period of time for the host to retract and cancel their reservation of the chef in question. Yet, BiBayti.com management’s mission extends beyond matching people and monitoring the service revolving around its platform. Through their new online venture, the partners want to announce as many of the amateur cooks to the greater public as possible, as well as provide easier access to the professional chefs among them, the direct result of which also being the discovery of many new tastes and flavors. But most importantly, by introducing that special experience to people’s homes, they are hoping to create a very different type of interaction between culinary artists and the individuals they are serving. Most of the time, people relishing a certain meal do not have the opportunity to meet the chef behind the food they taste, whether in a restaurant or at some venue in which a caterer provides the cuisine. BiBayti’s principal objective is for hosts to delight in the presence of their appointed chefs and benefit from their presence not only as cooks, but more as enlightening entertainers sharing a passion embodied in the several intricate recipes they are serving. One cannot be anything but excited about the launch of BiBayti’s website in the coming weeks as it will undoubtedly incite the hospitable ones among us to finally start planning that event they have been continuously postponing!